, an eminent French astronomer, was born in Paris, Sept. 25, 1736. His father | was the fourth in succession of his family who followed the profession of a painter and young Bailly was also destined to painting, and had already made some progress in the art, when he showed a decided inclination for the study of the belles-lettres. 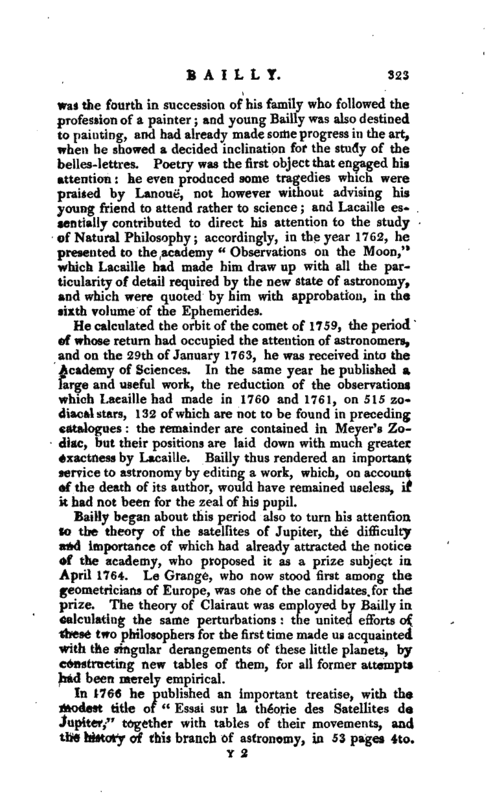 Poetry was the first object that engaged his attention he even produced some tragedies which were praised by Lanoue, not however without advising his young friend to attend rather to science and Lacaille essentially contributed to direct his attention to the study of Natural Philosophy accordingly, in the year 1762, he presented to the academy “Observations on the Moon,” which Lacaille had made him draw up with all the particularity of detail required* by the new state of astronomy, and which were quoted by him with approbation, in the sixth volume of the Ephemerides. He calculated the orbit of the comet of 1759, the period of whose return had occupied the attention of astronomers, and on the 29th of January 1763, he was received into the Academy of Sciences. In the same year he published a large and useful work, the reduction of the observations which Lacaille had made in 1760 and 1761, on 515 zodiacal stars, 132 of which are not to be found in preceding catalogues the remainder are contained in Meyer’s Zodiac, but their positions are laid down with much greater exactness by Lacaille. Bailly thus rendered an important service to astronomy by editing a work, which, on account of the death of its author, would have remained useless, if it had not been for the zeal of his pupil. Bailly began about this period also to turn his attention to the theory of the satellites of Jupiter, the difficulty and importance of which had already attracted the notice of the academy, who proposed it as a prize subject in April 1764. Le Grange, who now stood first among tha geometricians of Europe, was one of the candidates for the prize. The theory of Clairaut was employed by Bailly in calculating the same perturbations the united efforts of these two philosophers for the first time made us acquainted with the singular derangements of these little planets, by constructing new tables of them, for all former attempts had been merely empirical. In 1766 he published an important treatise, with the modest title of “Essai sur la theorie des Satellites de Jupiter,” together with tables of their movements, and fche history of this branch of astronomy, in 53 pa-es 4to, | The most ingenious memoir which he published, is that for 1771 on the light of the satellites. On this occasion he availed himself of an excellent idea of F’ouchy, of covering the end of a telescope with thin pieces of bladder till the satellite could be no longer seen, in orderly this means to measure the degree of its light. He also observed and calculated the changes produced by their proximity to Jupiter, and their altitude above the horizon he ascertained their diameters, the duration of their several immersions, and invented a method of composing the observations made with different telescopes, by which he introduced a degree of perfection till that time unknown in this part of astronomy. The intervals of his astronomical labours were agreeably occupied by general literature. In 1767 he was elected member of the academic Frangoise, for his eloge of Charles V. a work which obtained distinguished praise from the academy, though fhe prize was adjudged to La Harpe. In 1768 he sent to the academy of Rouen the eloge of Corneille, which gained the accessit. His eloge of Leibnitz, sent to the academy of Berlin, obtained the prize. In 1769 his eloge of Moliere gained the accessit at the academic Franchise the prize was gained by Chamfort. 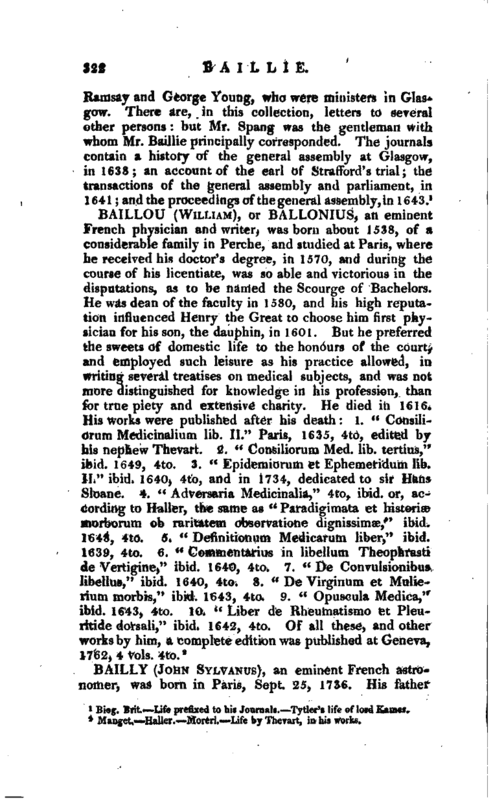 His abilities in this style of writing were still further rendered conspicuous by the eloges of Cook, Lacaille, and Cresset; so much so, that Buffon and many other members of the Academic des Sciences wished to obtain him the appointment of secretary to that distinguished society; and though at the election in 1771, Condorcet had the majority of votes, yet the nobility of his birth and the exertions of d’Alembert probably contributed very essentially to secure him the preference. Bailly was at length recompensed by the Academic Franchise, by being appointed on February 26th, 1784, the successor of Tressan. 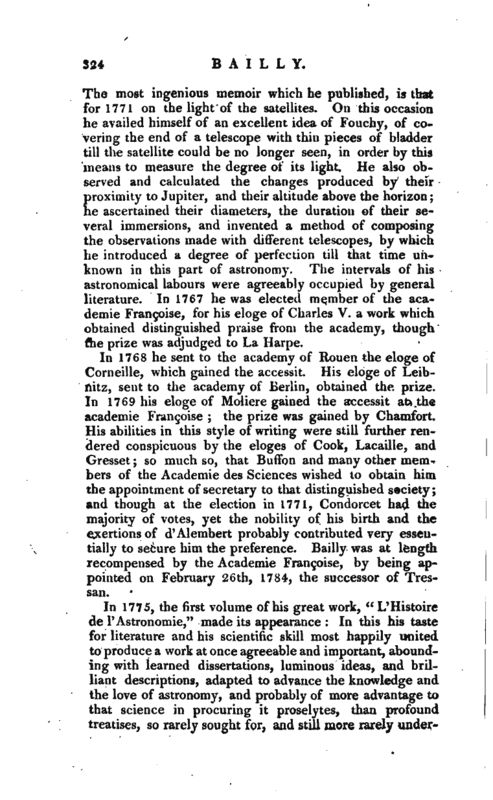 In 1775, the first volume of his great work, “L‘Histoire de l’Astronomie,” made its appearance In this his taste for literature and his scientific skill most happily united to produce a work at once agreeable and important, abounding with learned dissertations, luminous ideas, and brilliant descriptions, adapted to advance the knowledge and the love of astronomy, and probably of more advantage to that science in procuring it proselytes, than profound treatises, so rarely sought for, and still more rarely | understood. L’Histoire de PAstronomie, though not a treatise on this science, is so elementary, so simple, and so agreeable, as in a great measure to conceal its difficulties, and display to the greatest advantage its attractions and beauties. 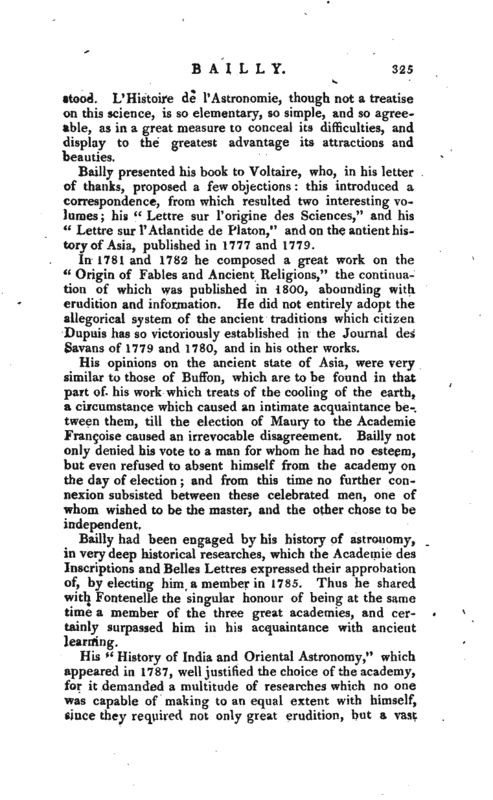 Bailly presented his book to Voltaire, who, in his letter of thanks, proposed a few objections this introduced a correspondence, from which resulted two interesting volumes; his “Lettre sur Porigine des Sciences,” and his “Lettre sur PAtlantide de Platon,” and on the antient history of Asia, published in 1777 and 1779. In 1781 and 1782 he composed a great work on the “Origin of Fables and Aflcient Religions,” the continuation of which was published in 1800, abounding with erudition and information. He did not entirely adopt the allegorical system of the ancient traditions which citizen Dupuis has so victoriously established in the Journal des Savans of 1779 and 1780, and in his other works. His opinions on the ancient state of Asia, were very similar to those of Buffon, which are to be found in that part of his work which treats of the cooling of the earth, a circumstance which caused an intimate acquaintance between them, till the election of Maury to the Academie Franchise caused an irrevocable disagreement. Bailly not only denied his vote to a man for whom he had no esteem, but even refused to absent himself from the academyn the day of election and from this time no further connexion subsisted between these celebrated men, one of whom wished to be the master, and the other chose to be independent. Bailly had been engaged by his history of astronomy, in very deep historical researches, which the Academic des Inscriptions and Belles Lettres expressed their approbation of, by electing him a member in 1785. Thus he shared with Fontenelle the singular honour of being at the same time a member of the three great academies, and certainly surpassed him in his acquaintance with ancient learning. His “History of India and Oriental Astronomy,” which appeared in 1787, well justified the choice of the academy, for it demanded a multitude of researches which no one was capable of making to an equal extent with himself, since they required not only great erudition, but a vast | variety of calculations, to which men of letters are seldom equal. The animal magnetism of Mesmer, as practised by Deslon in 1784, occasioned a most extraordinary and unaccountable agitation at Paris. 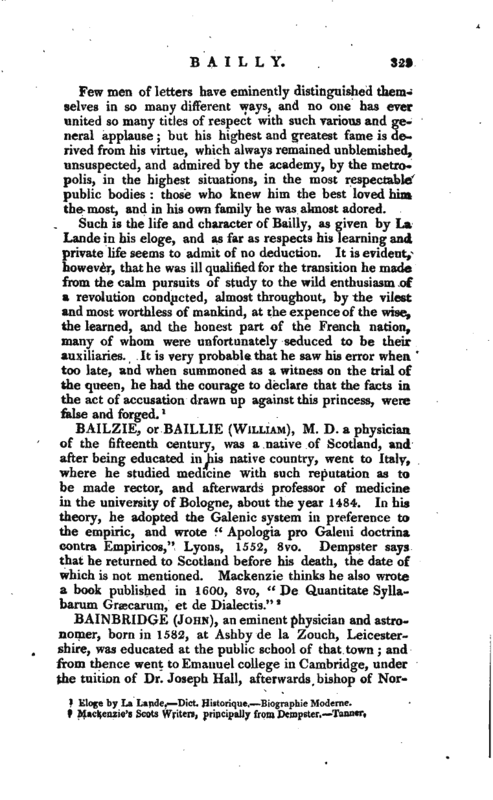 In order to satisfy the curiosity of the public on this subject, a number of physicians were nominated by the king, and of natural philosophers by the academy Bailly was one of the commissioners, and was chosen by the rest to draw up their report. It occupied 108 pages in octavo, and engaged his principal attention for a considerable time, for it was an important fact in the history of the errors of the human mind, and a most extraordinary instance of the power of imagination. 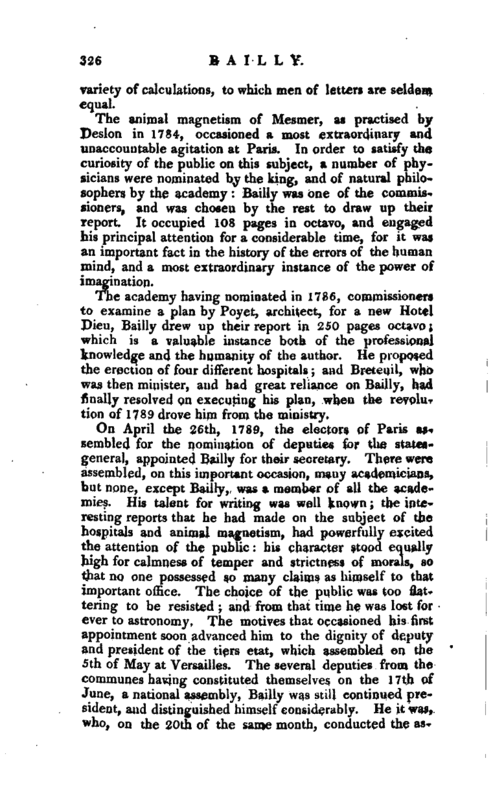 The academy having nominated in 1786, commissioners to examine a plan by Poyet, architect, for a new Hotel Dieu, Bailly drew up their report in 250 pages octavo which is a valuable instance both of the professional knowledge and the humanity of the author. He proposed the erection of four different hospitals and Breteuil, who was then minister, and had great reliance on Bailly, had finally resolved on executing his plan, when the revolution of 1789 drove him from the ministry. On April the 26th, 1789, the electors of Paris as*. sembled for the nomination of deputies for the statesgeneral, appointed Bailly for their secretary. There were assembled, on this important occasion, many academicians, but none, except Bailly, was a member of all the academies. His talent for writing was well known the interesting reports that he had made on the subject of the hospitals and animal magnetism, had powerfully excited the attention of the public his character stood equally high for calmness of temper and strictness of morals, so that no one possessed so many claims as himself to that important office. The choice of the public was too flattering to be resisted and from that time he was lost for ever to astronomy. The motives that occasioned his first appointment soon advanced him to the dignity of deputy and president of the tiers etat, which assembled on the 5th of May at Versailles. The several deputies from the communes having constituted themselves on the 17th of June, a national assembly, Bailly was still continued president, and distinguished himself considerably. He it was, who on the 20th, of the same month, conducted the | asse-nbly to the tennis-court, and he still continued to preside, when, on the 27th, the two other orders united themselves to the tiers-etat. He resigned his office on July 22d, and the duke of Orleans was appointed his Sik> cessor. When the king arrived at Paris, on the 25th of July, after the capture of the Bastile, Bailly was chosen by public acclamation, chief magistrate of the city, under the name of Mayor of Paris. It is not our intention to follow him through the whole of his political career his eulogist, however, affirms that in his situation as deputy, president, and mayor, he exhibited the wisdom, the firmness, and the moderation of a philosopher. He is accused by some of having endeavoured to debase the royal dignity, and by others of having wished unreasonably to exalt it. The validity of these contradictory charges can only be ascertained by some future generation. He might possibly be mistaken, but the rectitude of his conduct as a magistrate, his ardent desire to promote the welfare of his countfy, and his entire devotedness of his time, his life, his favourite studies, and his happiness, to this great object, are unquestionable. The public bodies to which Baiily belonged, bore distinguished evidence to his worth; his bust was placed in the municipality, and in the academy of sciences, where that of any of its living members had never been deposited. His honours now rose to their futl height. Placed between the people and the king, though responsible to both, he protected them from each other his influence was of infinite service to them, and he maintained the equilibrium of a philosopher, amid the sohcitations of both parties. The most disagreeable period of his administration, and the most fatal in its effects, was the 17th of July, 1792, when the party in opposition to the monarchical constitution excited commotions in the people, which he was obliged to quell, by order of the national assembly. He was forced to repair to the Champ de Mars, where, notwithstanding his precaution, some muskets were discharged on the crowd. For this act, two years after, his head was demanded, when the only object of the reigning tyrant was to flatter the people, to indulge its passions, and even exceed its resentments. 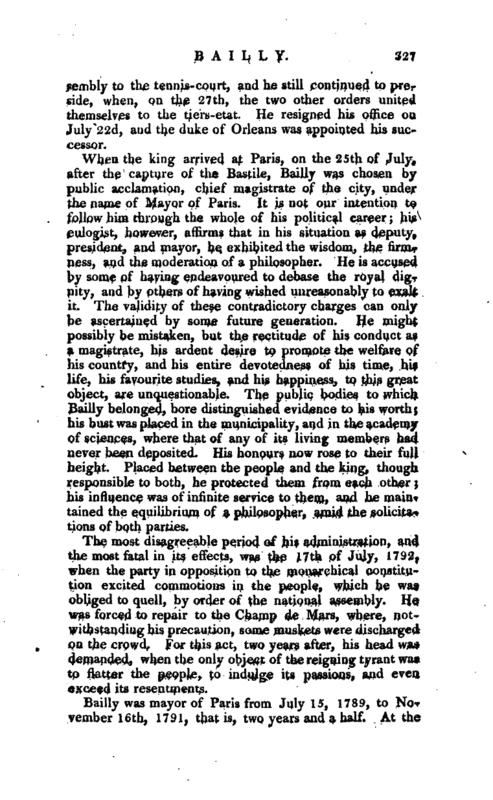 Bailly was mayor of Paris from July 15, 1789, to November 16th, 1791, that is, uvo years and a half. At the | conclusion of this period he was induced to resign his situation on account of the opposition raised by the democratic party who wished to substitute Petion, the declining state of his health not allowing him to engage in active measures to secure his continuance in office. He spent the year 1792 and part of 1793 in travelling, and writing an account of those extraordinary events which he had witnessed, and in which he had been a distinguished actor. These memoirs, which are not carried lower than October 2, 1789, were published in 1804. The edition in two volumes published in 1790 by Debure, of his speeches and memoirs, contains only those that were written before Sept. 1789. When the remainder of them shall be collected, they will add much interest to his character and conduct. During his journey he was by no means ignorant of the plans that were forming against him, and several opportunities offered of quitting France Cato said ingrata patria mea, nee ossa habebis. Bailly, more firm than Cato, preferred the example of Socrates, and refused to abandon his country. 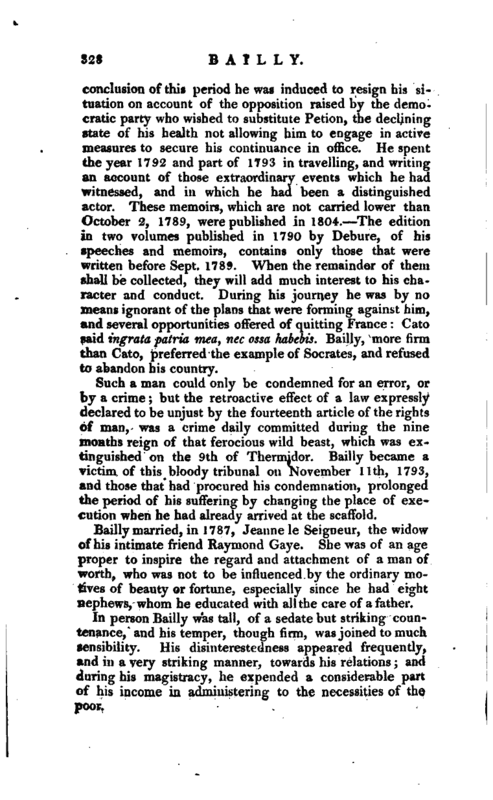 Such a man could only be condemned for an error, or by a crime but the retroactive effect of a law expressly declared to be unjust by the fourteenth article of the rights of man, was a crime daily committed during the nine months reign of that ferocious wild beast, which was extinguished on the 9th of Thermidor. Bailly became a victim of this bloody tribunal on November llth, 1793, and those that had procured his condemnation, prolonged the period of his suffering by changing the place of execution when he had already arrived at the scaffold. Bailly married, in 1787, Jeanne le Seigneur, the widow of his intimate friend Raymond Gaye. She was of an age proper to inspire the regard and attachment of a man of worth, who was not to be influenced by the ordinary motives of beauty or fortune, especially since he had eight nephews, whom he educated with all the care of a father. In person Bailly was tall, of a sedate but striking countenance, and his temper, though firm, was joined to much sensibility. His disinterestedness appeared frequently, and in a very striking manner, towards his relations and during his magistracy, he expended a considerable part of his income in administering to the necessities of the poor. | Few men of letters have eminently distinguished themselves in so many different ways, and no one has ever united so many titles of respect with such various and general applause; but his highest and greatest fame is derived from his virtue, which always remained unblemished, unsuspected, and admired by the academy, by the metropolis, in the highest situations, in the most respectable public bodies: those who knew him the best loved him the most, and in his own family he was almost adored. Eloge by La Lande.—Dict. Hist.orique.—Biographie Moderne.